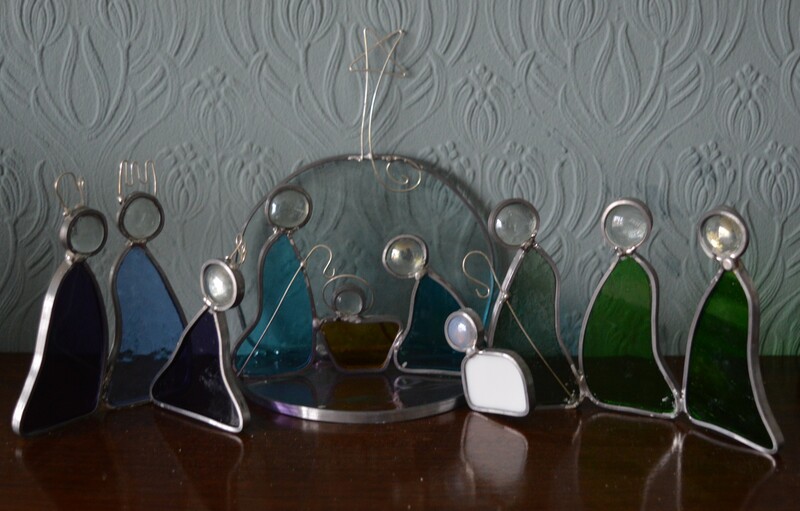 On Saturday I went with a WI friend for a fabulous day at Alma House on a workshop making a stained glass nativity. Alma House is our WI federation’s office in Ripon. Our tutor for the day was Rachel Poole, she was great, she had prepared us all a box of equipment which include one piece of glass already cut out, this was either Mary or Joseph. These two shapes made the templates for all the figures, our neighbour had the other one so we could swop templates, basically it was a kneeling person and a standing person. First lesson was how to cut glass, I didn’t find it easy scoring the glass along a wavy line, and trying to break it ‘like a kitkat’ was somewhat scary!! Luckily the next stage was grinding the edges, this neatened off all the bits I cut badly and allowed me to add curves where I’d missed them off completely! Whilst I was waiting to use the grinder, Rachel suggested I looked for some glass to make a stable, I found a small circle in her box, but I then cut a circle shape for the back, I was particularly pleased with this one, I actually managed to cut an OK circle!! This photo from the internet shows the technique pretty well. I’ve never done any soldering before, it was quite scary to start with! We worked in pairs again, one holding and the other soldering, you certainly had to trust your partner as the heat coming off a 1000’C soldering iron an inch or too from your fingers is pretty intense! We both kept having to remind each other to add tallow, a beef wax without which the solder won’t stick. It was fascinating watching the solder move, a bit like mercury, I still don’t really understand how it doesn’t break the glass just from the heat. Once the basic figure was soldered we could add the extras, such as shepherds crooks, crowns for the kings and a halo for Jesus, these are made from silver wire and Rachel had shaped them already, all we had to do was solder them on. I fancied a star on my stable too, Rachel gave me a length of silver wire, I decided to make it a shooting star so I would have enough contact points to secure it, so I bent a five pointed star with a long tail that curled round at the base, this gave me several points to solder. Solder cools almost instantly, and once the sets of figures were soldered together at the front they could be bent round so the group would stand. We then filled in the back of the join with more solder. I am well chuffed with my nativity, as well as amazed that we all completed a whole set, three kings, three shepherds and a sheep as well as Mary, Joseph and Jesus. I think this was one of the best workshops I’ve done at Alma House, Rachel was great, she kept it fun whilst making sure we were safe, she was patient and an excellent teacher. My nativity is on display on my fireplace and it can stay there until after Christmas now, you don’t get the effect of light through it but it is safer up there and I can always put some Christmas lights around it! This entry was posted in Christmas, Serendipity and tagged Christmas, Stained glass, Stained Glass Nativity, WI. Bookmark the permalink. So beautiful! Very impressive that this is your first attempt. I love this little nativity. I have a friend who makes stained glass panels and I’ve commissioned her to make a couple for above two doors in our house which have boring plain glass in at the moment. She says manipulating the lead is quite physically demanding but I guess it’s not so bad on the small pieces. This little scene will look lovely with some little lights around it for Christmas. oh well done! you obviously had lots of fun learning a new craft and your nativity scene is lovely! They are quite lovely Catherine. The flowing, simplified shapes of the figures are very pleasing and so different to the complex embroidery you have been doing! My Dad did lead lighting too. One of my windows is a work of his, showing two blue wrens on a fence. It is a treasured possession, and coming with me if I ever move house! What a great result from just a day’s course! Your teacher was obviously very good and careful, and the design is perfect, simple but very eloquent. And it’s nice that the result is something you’d actually use rather than something that’s ‘just for pretty’. I’m impressed! It’s a lovely nativity glass set. Lights added just right would give it a nice glow. That is a beautiful nativity! I would never have guessed it was your first time doing something like this, you did an amazing job! What a great workshop! I have always wanted to try stained glass, this is the type of project that could work. I love your nativity!!! Thanks Kathy, I’m already looking forward to next years workshop! Such beautiful Nativity! The glass work looks like it was so fun:). Great job! This is beautiful! I tried stained glass when I was younger – it sure was tough on the hands and cutting and breaking the glass wasn’t easy – I sure was happy when it all worked out! Thanks Linda, I ended up using pliers to break it a lot of the time! Oh I had trouble even with some special pliers. I think I needed more practice! That’s the best crafty thing I’ve seen in a long time, and you came home with it all finished! Better than a bought one and so neatly made. It will give pleasure to all who see it. Wow, this is fabulous! You did an amazing job! How fabulous! I love it! Wow! I am really impressed with your project. 🙂 Very daring to try such a different craft, too.